The essential element of the figure-ground theory is a concern with the relation between the coverage of buildings as solid mass (‘figure’) and open voids (‘ground’). The urban pattern (in plan) is seen as a fabric, which can be modified. The linkage theory focuses on ‘lines’ to connect various urban elements with each other. This linear emphasis can find expression in streets, lanes, pedestrian ways and/or open spaces. The general idea is that of a network, with lines providing the structure for ordering space. The place theory adds a ‘human touch’ to the previous theories by paying attention to the historical, cultural and social setting of a particular urban design. The internal context is given preference above the abstract designs imposed from the outside. Trancik’s conclusion is clear: ‘Each of these approaches has its own value, but the optimum is one that draws on all three, giving structure to the solids and voids, organizing the links between parts, and responding to the human needs and unique elements of the particular environment’ (TRANCIK, 1986; p. 98). An analysis of these three theories would place the figure-ground theory in the Third Quadrant of a quadralectic communication. Mass and void are in some sort of dualistic struggle and the ‘winner’ or ‘looser’ is determined by the choice of the observer. Trancit spoke in this context of ‘lost space’, which can be found in large parking lots, the leftover unstructured landscape around high-rise towers and other areas of underused space. The opposite is the ‘positive urban space’ or ‘found’ space. An element of inversion – so typical for the Third Quadrant – is active all the time. Good can become bad and lost space can be found. Giambattista Nolli’s ‘Map of Rome’, drawn in 1748, is given (by Trancik) as an illustration of the theory. The open space is ‘carved out of the building mass as a continuous flow linking interior and exterior spaces and activities’. Voids are created in a mass and space becomes an object in its own right. The emphasis is on the horizontal direction created in flat building masses. The aim is to make a front, which can be punctuated, by empty spaces. This situation is the complete opposite (inversion!) of the modern approach where buildings ‘rule’ over their environment and verticality is predominant. The linkage theory – characterized by an organization of lines – would fit in a Second Quadrant approach to urban design. Circulation and connection become a major centre of attention. ‘Linkage is simply the glue of the city’ said Fumihiko Maki. The actual ‘lines’ can be, in his view, part of a compositional form, a mega form or a natural, group form. The linkage theory was popular in the sixties of the twentieth century when large-scale urban planning took place. Its results are now viewed with some disgust by the same generation for which these houses were built. The place theory emphasizes the contextual meaning of a space derived from its social, cultural and historical-emotional content (as a place). This theory requires a study of the (historical) identity of a place in relation to the need of its contemporary users. The type of urban development related to this theory was mentioned earlier by Christopher ALEXANDER et al (1987). It was classified as ‘organic’, based on the idea of a growing whole. The practical implications of the place theory caused, according to Trancik, at best to a ‘minimal interference in the social and physical setting’. More often the findings of the designers – who are essentially no historians – gave way to a redefinition of old patterns and styles. Over-designing and too much planning were the result. The human distinction in spatial design theory matches best in the Fourth Quadrant of a quadralectic approach. The problems as given above – of certain sentiments becoming overpowering and unnatural – are typical for this quadrant. The demarcation between over-designing and its fearful opposite of ‘allowing the marketplace to shape cities in a random, ad hoc fashion’ is – on a psychological level – the abyss between the Fourth (IV) and the following First Quadrant (I). The last ‘theory’, not separately mentioned by Trancik, would be the ad hoc or random theory, belonging to the First Quadrant. The outcome of ‘under-design’ – when everything is left to the individual developers – is manifested in the dreaded ‘lost spaces’ of the modern city. The question is than: ‘how lost are these spaces?’ Maybe they provide, in the end – which is, according to T.S. Eliot, also a beginning (ELIOT, 1936/63) – the creative key to a different type of city planning. The particular types of visibility are reflected in the four types. The random plan (1) is shrouded in the mystery of the invisible invisibility. There are no immediate limitations, only the occasion. An opportunity can spring up any time and disappear just as fast. It embodied the unlimited possibilities of the First Quadrant. The linkage theory (2) thinks in terms of an invisible visibility as given in the Second Quadrant. Certain ideas – in itself symbols of movement – can be caught on the drawing board. A spatial datum can be created and used in subsequent planning. The figure-ground theory (3), with its emphasis on solids and voids, is characterized by the visible visibility of the Third Quadrant. Roger Trancik (p. 101; Fig. 4-5) distinguished six types of typological patterns of Solids and Voids: the grid, angular, curvilinear, radial/concentric, axial and organic configuration. A city planner, thinking in terms of solids and voids, has to follow these four positions in order to make a choice. Clearly, the outcome reflects the mood of the creative designer (or the team of designers) at that particular time. 1. A circular or radial-concentric approach to (city) building is related to the universal world of the First Quadrant, with its center (point) as a source of unity, distributing itself in a specter of innumerable rays. Concentric building aspires a universal coverage of space. 2. The cross-shape is the result of the (Second Quadrant) idea that the division of space in four compartments can be achieved by the drawing of two crossing lines. The cross (not necessarily perpendicular) is the shortest way from the two-division (on a local scale) to a four-division (on a universal scale). Many cities find their origin in just two crossing roads, cutting the landscape in four quarters (areas). 3. The rectangular-shaped of a city plan is the more confined expression of the four-fold in action (in the Third Quadrant). Four points mark the limitations in the field. There is no direct spatial relation to the four-fold (like it was in the cross-shape) other than the number four. The rectangular is – even if its generation is based on four points – a rather oppositional feature: a point (observer) is either in or out of the delimited area. 4. The combination of the previous approaches – consisting of a point, two crossing lines and four crossing lines – find its new form of expression in the grid. The (organized) multitude is the hallmark of this (Fourth Quadrant) type of city planning. The grid might have many forms and may even be subdivided along tetradic lines. The most familiar grid of squares – like the old Roman town designs and many American cities – would then be a ‘Third Quadrant’ feature. The logical developed ‘fractal’ grids (MANDELBROT, 1982), with its element of self-similarity, would qualify as a ‘Fourth Quadrant’ type of grid-building. Finally, the place theory (4) – as the last of the above-mentioned three-division in urban spatial designs by Roger Trancik – is characterized by the visible invisibility of the Fourth Quadrant. There is so much to see – in the minds of people and their sociological and historical background – that visibility gets lost or becomes simply inaccessible because of its quantity. The place theory, which takes the depth of human feelings into account, is probably closest to the quadralectic outlook. It also deals with the same practical problems in the process of implementation. A statement of urban design has to include the position of the observer. The lost space can be found again if the quadralectic spirit had made its full journey through the quadrants. The terrain of city design is wide and varied. Each town, all over the world, has its own tale to tell with regards to its foundation, with or without planning, its more or less interrupted growth and its present, either willingly or unwillingly, visible results. The introduction of some examples of the above-mentioned types of city design will be eclectic and at random. However, the examples – often the end members of a gradual scale of intermediate forms – might give the inspiration to further investigations in this interesting field. They hope to provide the tools to qualify or even quantify the different products of human endeavor. The developments of new towns have a magic of their own. They embody a dynamic and creative stage in the human existence. People take the decision to stick together and make their living in a social environment. The sociological and psychological laws of interaction, which can be applied on a multitude, influence this setting. The quadralectic world view is interested, for this very reason, in the thoughts behind the generation of (new) living environments. Ervin GALANTAY (1975) concluded, as editor of a book on city planning, that the trend of building new capital cities – with three planned capitals in the decade 1950 – 1960 (Brasilia, Canberra, Chandigarh) – will probably not be sustained. His conclusions were right. It is even fair to say that any great scheme of town development has no longer occurred since the sixties of the twentieth century. Galantay’s prediction of futuristic communities in the tundra’s, Sahara, underwater or in the Arctic and Antarctic regions did not materialize (yet). The large urbanizations of the world deal with their congestion problems rather than searching for new open spaces to invade. 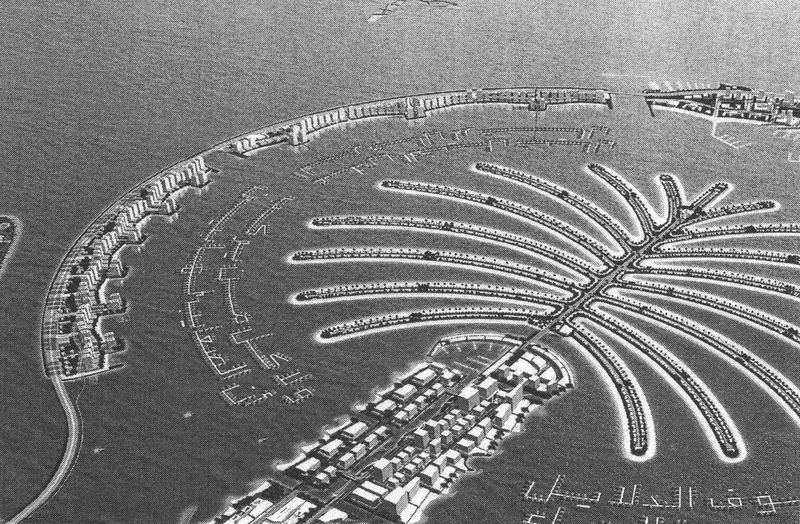 Only the Dubai project, with its artificial islands in the shape of a palm (fig. 517), qualify as a ‘specialized hedonistic community’. The new city of the coast of Dubai (UAE) lacks any productive employment base and is therefore ‘parasitic’ in the Marxist sense, but cannot be ignored as a creative statement. This visible visibility takes place in an Arabian cultural context, which still has to be determined. One may expect that other emerging economic entities will also try to start on new large projects in order to establish their identity. Fig. 517 – This plan of the second man-made ‘palm island’ called Jebel Ali, constitute of large entertainment areas for adults and children. The project is situated at the coast of Dubai (United Arab Emirates) and intended to establish a visibility in the world.